Jen joined the MPO in January, 2013. 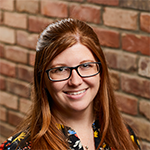 Since graduating from Ball State University with a Bachelor of Urban Planning and Development, Jen has been involved in a wide variety public and private planning projects. Working in in the private sector, her experience ranges from downtown plans for small towns of 1,000 people to comprehensive plans and land use ordinances for communities of more than 100,000. She was accepted into the American Institute of Certified Planners (AICP) in 2009. Jen has made Downtown Indianapolis her home since 2005 and currently resides on the city's near eastside.